Little Rock Lawns designs & installs hardscaping for Little Rock, West Little Rock, Maumelle, and North Little Rock homes & businesses. 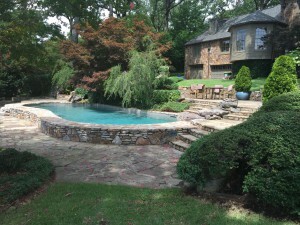 Whether you want to create a beautiful outdoor living space, build or replace a walkway, or add a refreshing water feature to your landscape, Little Rock Lawns can design and build it. We’ll design a hardscape to structure & organize exterior spaces and compliment your home or business. Call Little Rock Lawns today, and let us show you how we can enhance your home’s beauty, increase its value, and expand your living space with professionally designed and installed hardscaping. Once we’ve installed a hardscape frame for your landscape, Little Rock Lawns can complete the picture with the right plants in the right places. We’ve got the experience to select the perfect plant for every site & need to create the landscape of your dreams. We provide professional maintenance services, too – with Little Rock Lawns, all that’s left for you to do is enjoy your beautiful lawn & garden. Little Rock Lawns will keep your outdoor living areas clean and ready for use year-round. Call us today for hardscaping maintenance in West Little Rock, Little Rock, North Little Rock or Maumelle. Little Rock Lawns provides design & construction expertise for all your hardscaping needs with friendly, reliable service from a locally owned & fully insured professional landscaping company. Call us for a FREE estimate for hardscaping your North Little Rock, Little Rock, West Little Rock, or Maumelle home or business.